The going is officially good, good to soft in places, for the opening day of the Paddy Power Gold Cup meeting at Cheltenham on Friday. The card opens at 1.05 with the Paddy Power Handicap Chase over two miles with fifteen runners set to go to post. The favourite here is David Pipe’s La Vaticane, a French import making her chasing debut in the UK. The grey has won five times in France and made her debut for her new yard over hurdles at Kempton in March. She led three from home but could not hold off Nicky Henderson’s Theinval and was beaten two and three-quarter lengths into second. The winner followed up in a valuable handicap at Aintree the following month so that was a good effort. The daughter of Turgeon likes to race up with the pace and can get favourite backers off to a winning start. Pipe saddles Dell’ Arca in the novices’ chase at 1.40 but he has to concede 5lbs to 2014 World Hurdle winner More Of That. Jonjo O’Neill’s gelding has been off the course since November last year when beaten at odds-on at Newbury. He is rated upwards of 25lbs higher than his rivals over hurdles and this looks an ideal opportunity to launch his chasing career. Penglai Pavilion is chasing a four-time for John Ferguson in the Grade 2 novices’ hurdle at 2.15. The former high-class flat performer dispelled doubts about his stamina when sprinting clear of Laurium over course and distance. Neil Mulholland saddles the unbeaten Shantou Village who was impressive at Carlisle last month but is yet to meet a rival as classy as Penglai Pavilion. Uncle Junior is taking part in the Glenfarclas Cross Country Chase for the fifth consecutive season. He has been successful twice and was runner-up to Balthazar King on the other two occasions. He is now fourteen years of age but could probably find his way around here without assistance from the saddle and should make the frame again. 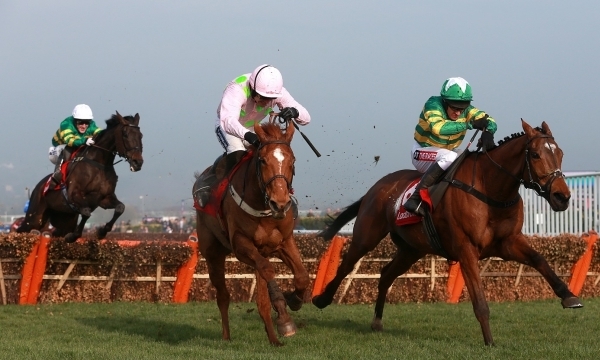 The likely favourite is Enda Bolger’s Josies Orders who has shown form in similar events and should be fit after a run over hurdles last month. Nina Carberry takes the ride on this one while Any Currency and Sire Collonges are other regular competitors in these cross country events. The 3.25 looks wide open with Ruby Walsh looking a significant booking for Dollar And A Dream, trained by Tony Martin. He was an impressive winner at Galway in August but was beaten off a 9lbs higher mark at Listowel last time. Ink Master looks dangerous from the in-form Philip Hobbs stable after winning easily at Worcester last month. Definite Ruby was runner-up at the last Cheltenham meeting and is fancied to go one better for Gordon Elliott in the amateur riders’ race which closes the card at 4.00. There is no better amateur than Jamie Codd and he looks the value bet in a tricky finale.